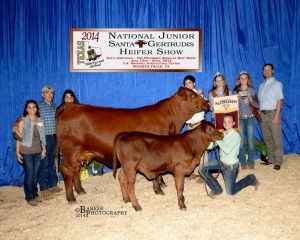 MC 202 (polled) is the 2014 National Junior Heifer Show Grand Champion. She was bred by MC Ranch and exhibited by Will McDaniel. MC 202 exhibits the qualities of an ideal Santa Gertrudis female. She is eye appealing, deep bodied and structurally correct. Keep an eye for her daughter, MC Lexington, who is already proving to be just a successful in the show ring as her dam. At the completion of her show career, MC 202, will go into MC Ranch‘s embryo donor program. Inquire about opportunities to make your bull famous.